In celebration of its 20oth anniversary the American Antiquarian Society published a beautiful exhibition catalog titled “In Pursuit Of A Vision – Two Centuries of Collecting at the American Antiquarian Society”. Featured are a fascinating array of books, documents, maps & other paper ephemera, as well as several very rare & unusual newspapers we felt worthy of sharing with our Rare & Early Newspapers’ collectors (with permission from the A.A.S.). The divisive political events of the 1850s had pitted North against South on numerous issues, including the expansion of slavery into the western territories, tariffs on goods such as cotton, and broader concepts of states’ rights vs. federal law. Political compromises made throughout the decade in an attempt to keep the nation together effectively collapsed with the election of Abraham Lincoln in November 1860. South Carolina, heir to the legacy of states’ rights lion John C. Calhoun, was the first to address the possibility of leaving the Union. 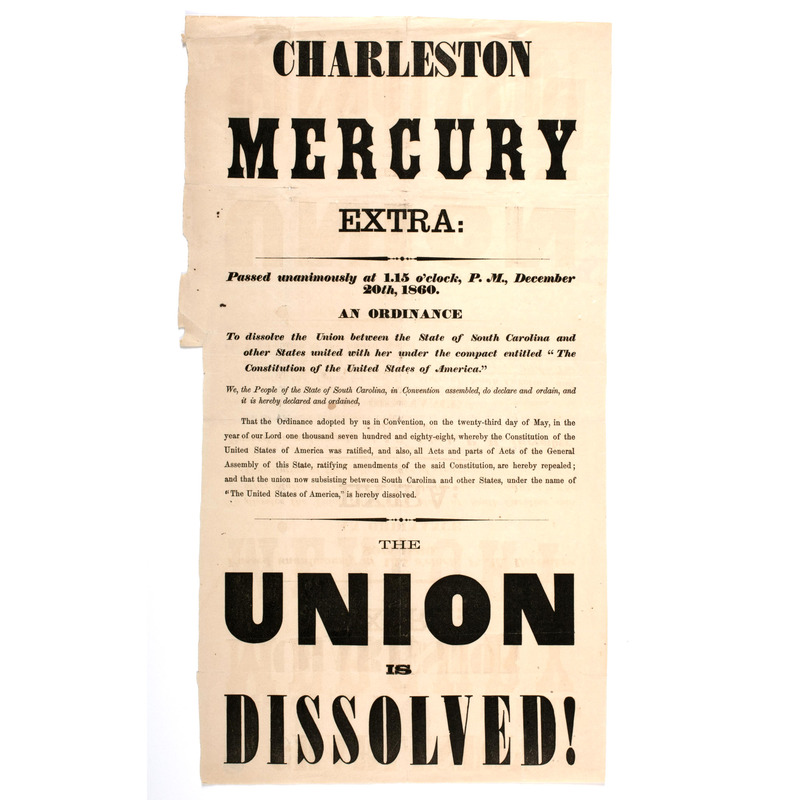 On November 10, 1860, four days after the presidential election, South Carolina brought the issue to a head by calling a secession convention for the following month. 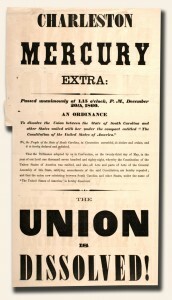 Considered by virtue of timing to be the first Confederate imprint, this broadside announced to the public the convention’s declaration, on December 20, 1860, that South Carolina would secede from the United States. This sheet was removed from a wall in Charleston by the Boston-born author Caroline Howard Gilman (1794-1888), who had moved permanently to Charleston following her marriage to the Rev. Samuel Gilman. Gilman mailed the broadside to her daughter Eliza in Salem, Massachusetts. Eliza in turn presented the document to AAS member Nathaniel Paine who, heeding the Society’s call to preserve all printed material relating to the unsettling national events, passed the broadside along to AAS.